Now this is the project for anyone who claims they aren't crafty or have no free time. And from the name I think you can figure out it's inexpensive. I noticed how interested Serena was with the plastic bottles I usually chuck into the recycling bin, so I thought why not make one into something for her? Coincidentally the very day this occurred to me, I stumbled across the very thing at Chasing Cheerios. Crafty moms think alike! 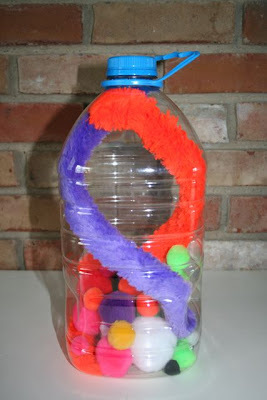 I took a big ol' juice bottle and put in some pom poms, a big jingle bell and a couple giant pipe cleaners and screwed the cap on tight. She can bat it around and roll it and see & hear all the fun stuff inside. I also love how the built in handle is easy for her to grab and to hang onto her playmat. Added bonus is being able to switch up the contents so it's always fresh & new. Obviously for safety purposes, this is for babies who can't unscrew a cap or gluing it on is a necessity. 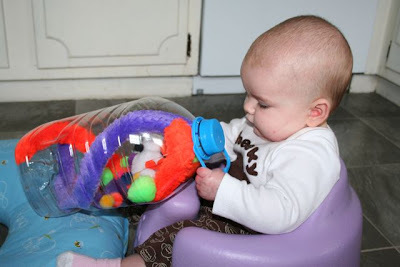 Cheap, a good way to "recycle" & fun for little ones. Trifecta of fun!! I realize that this will show how un-crafty I am, but this is genius! I think I need to get to the craft store and make one today! Thanks for the tip! I'm stopping by from friday follow, stop by when you can! You're kids are adorable, and I think home Olympics sound like so much fun! Cute blog! Found you on SITS but following now, I do Friday Follow too! Great ideas. dont you wish all their toys could be this easy forever? great idea! I've never thought about using one of those types of bottles, the little handle is perfect. Thanks for linking up with us today! How cute! Isn't it funny how the best toys are the ones that aren't "toys"! What a cute idea. I signed up to follow you. I am working my way through all my old followers and going back and forth between the old blog and the new one so forgive me if you have already RE-signed up to follow me. If you haven't please resign up. I am not allowed to take my followers with me when I moved my blog to my own site, so to get my updates in your reader you need to re-sign up.